Now, those pear tomatoes are too cute! They remind me of stacking dolls. Jordan thought they looked like penguins. Yep. Cute. This salad celebrates the end of summer with fresh tomatoes, quickly blanched green beans and a tarragon, shallot and white wine dressing. Conclusions: Jordan and I both liked the tarragon quite a bit. It’s not an herb we use often and it added a surprisingly satisfying anise flavor. Tomatoes and green beans are two of my absolute favorite ingredients and so I was pretty sold on this salad. It made a great accompaniment to the cous cous with sauteed mushrooms and pan-seared cod we also enjoyed, but were too beige to post a picture of. I love breakfast for dinner (french toast, waffles, pancakes, all those sweet, syrupy delights). Jordan, sadly, does not have the same fervor for breakfast for dinner as I do. This dish was our compromise. A poached egg with broiled asparagus, crispy bits of pancetta and skillet hash browns. Conclusions: Poaching eggs is not like riding a bike – it doesn’t just come right back. And, breakfast for dinner is the best! My devotion continues and Jordan said he considering coming over to the dark side. French Toast Fridays, anyone? 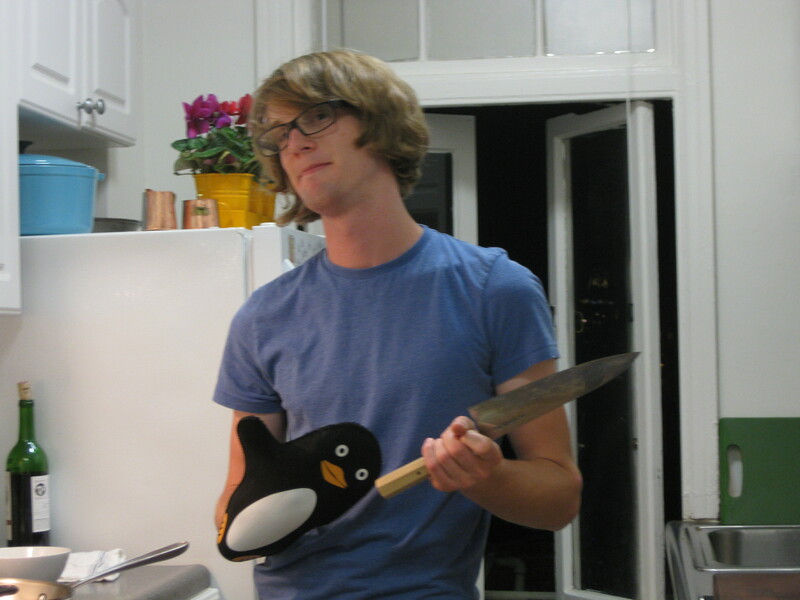 … He is incredibly dashing in the kitchen. Brown some PORK! chorizo*. 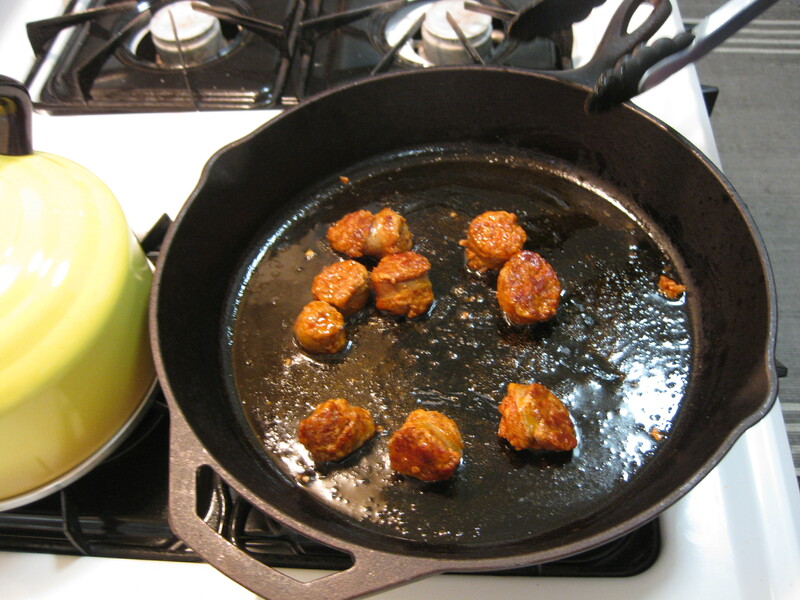 Take out the chorizo, but leave that delicious fat in the pan. Toss in some diced onions and garlic. Let those brown a bit. Add broth (Jordan did 3 cups of vegetable stock and 1 cup of clam juice). *Chicken chorizo was available, but we just don’t see the point in that. 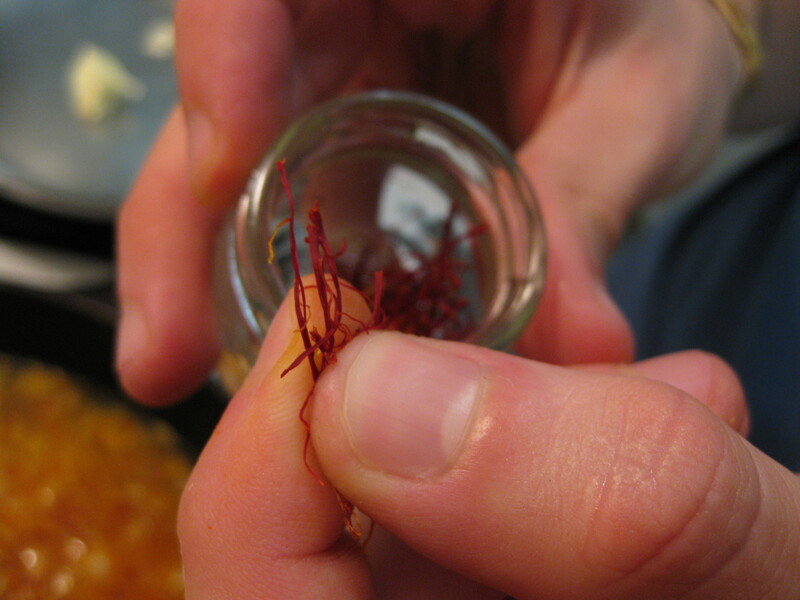 Add saffron. Ours was a gift from our neighbor and came all the way from Dubai! 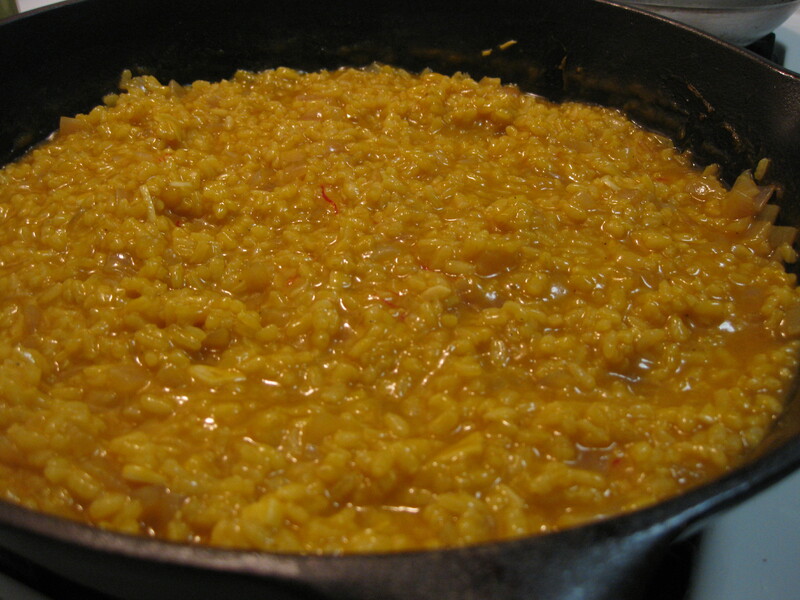 It adds a nice floral taste, and added bonus, the broth will turn a lovely yellow-orange color. Bring it all to a boil and add Calasparra rice. Use 1 parts rice to 4 parts liquid. We thought “That’s crazy!” but it really is quite absorbent. the seafood! Jordan’s catch of the day included shrimp and scallops, which he quickly sauteed in some butter before adding to the rice. He wanted to get a nice sear on the scallops, but he’s a bit out of practice. I think this means more scallops in my future! Served with lemon and parsley. Conclusions: Jordan was looking for a paella shortcut and looks like he found one. It still took a while to execute, but not much was lost in the way of flavor. Tasty and satisfying! 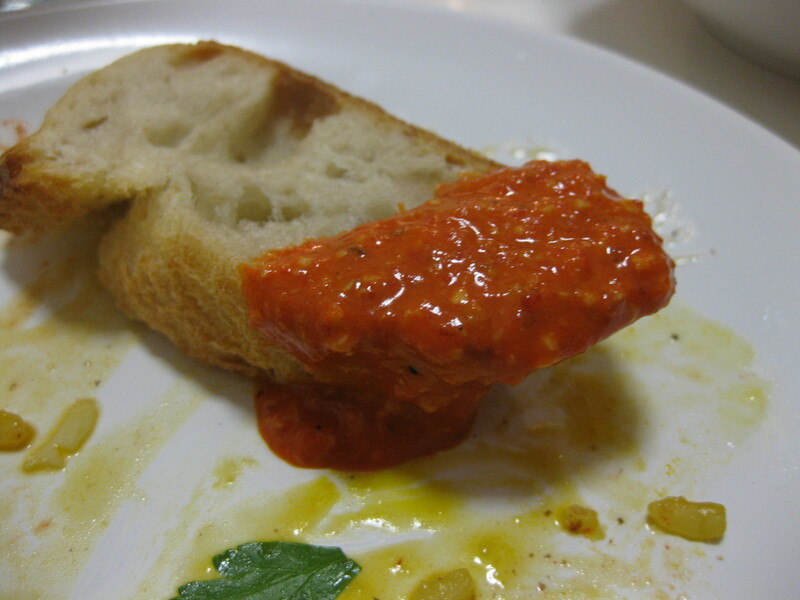 this romesco sauce from Bi-Rite Market (18th between Guerrero and Dolores). It was good, but I’m partial to his paella. 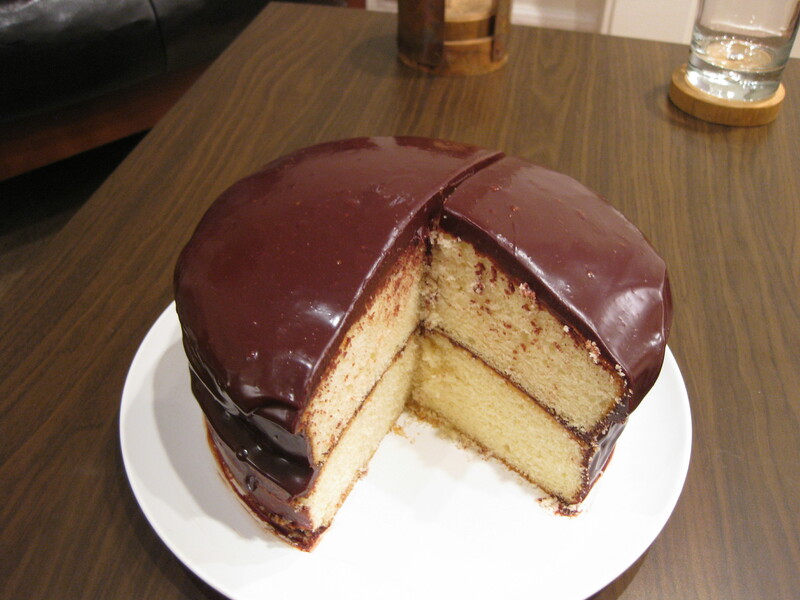 baking therapy: yellow cake with chocolate ganache. 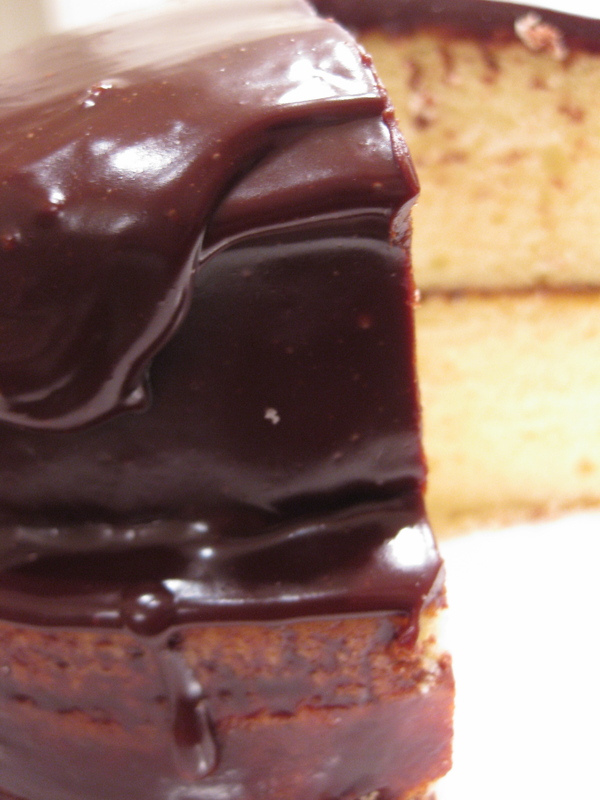 Today, the baking regime began … yellow cake with chocolate ganache. The background: While I was in school, I cooked and baked as a way to escape everyday stress. And, it worked! Now I have a moderately stressful job (like most everyone) and I’ve turned to my old standby with new determination. The plan: Bake something new each and every week as form of delicious and rewarding therapy. The hope: Bake -> be less stressed -> become a better baker -> bake some more -> become a happier person. Today’s cake recipe was from Rose Levy Beranbaum author of The Cake Bible. Preheat oven to 350 degrees F. Grease two 9-inch x 1 1/2 inch cake pans, line bottoms with parchment paper, then grease again. Set aside. 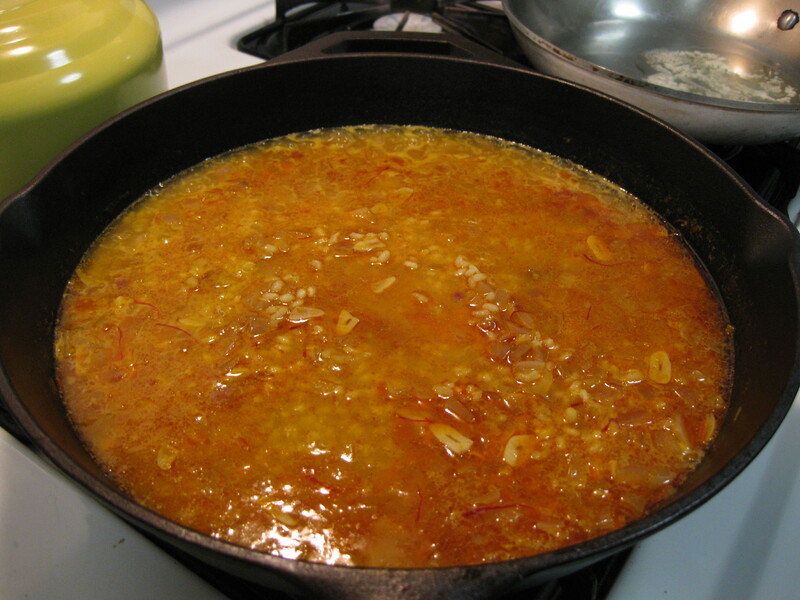 In a medium bowl lightly combine the egg yolks, 1/4 cup (60 ml) milk, and vanilla extract. In the bowl of your electric mixer combine the dry ingredients (flour, sugar, baking powder and salt) and mix on low speed for about 30 seconds or until blended. Add the butter and remaining 3/4 cup (180 ml) milk. Mix on low speed until the dry ingredients are moistened. Increase the mixer speed to medium and beat for about 2 minutes to aerate and develop the cake’s structure. Scrape the sides of the bowl. Gradually add the egg mixture, in 3 additions, beating about 30 seconds after each addition to incorporate the egg mixture. Divide the batter and pour into the prepared pans, smoothing the surface. Bake 25 to 35 minutes or until a toothpick inserted into the center of the cake comes out clean and the cake springs back when pressed lightly in center. Place the cakes on a wire rack to cool for about 10 minutes. Then invert the cakes onto a greased rack. To prevent splitting, reinvert cakes so that tops are right side up. Cool completely before frosting. Heat a 1/2 pint of cream and 2 tablespoons of butter over low heat. Pour hot cream over 10 oz of yummy semisweet chocolate (we like Guittard). Let that sit for about 5 minutes then whisk into submission (or until its smooth). Pour over the first layer of your cooled cake, spread, stack on layer two, pour again. Supposedly, this ganaching process is easy, but I managed to get chocolate all over my kitchen counter, three dish towels, a poorly placed bag of pirates booty and multiple utensils. If you decide to ganache, clear yourself some space or if you don’t have much space (like us), prepare for some clean-up afterward. Good. Satisfying. But a bit dry (maybe because I forgot about it in the oven while googling greyhound puppies) and definitely lacking ganache between the layers (I got nervous while ganaching the first cake. It was my first time after all). Yes, that is a standard-sized dinner plate. Overall, a lovely weekend baking adventure, stress level low, and we still have a monstrosity of a cake left to devour. We love San Francisco, but it has one small problem: there isn’t an awesome food blog around. Of course there are some great resources out there (especially when looking for inspirational recipes or ingredients to use at home) but when searching for a decent restaurant, common restaurant review sites aren’t up to snuff. We’ve had some awesome meals in the city but we have also been led astray by ‘credible reviews.’ This occurred last night when we decided to dine at Moussy’s due to the positive feedback it had received on the internet. Basically, we were disappointed, but more on that later. The reason for this blog is simple: those reviews aren’t helping us, so there must be others out there who are in the same situation as us; we just want to help. We’ve had better success going into a place on pure chance than we have after doing some extensive research. I’ll lay it out for you. We like good, simple food that’s done right. It can be cheap or expensive as long as the value is there. 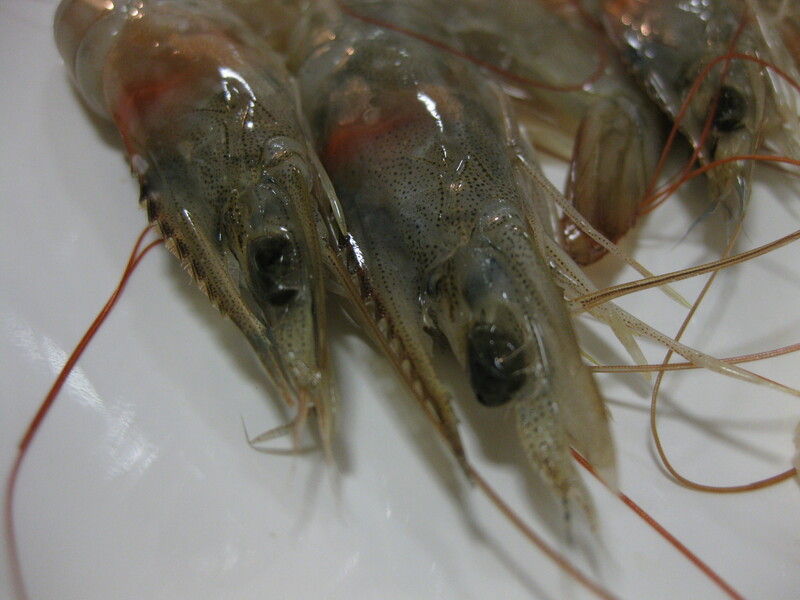 In the review portion of our blog, we will try to find some of the less obvious places and give you a clear and comprehensive assessment of the food, service, etc. It probably won’t come down to the standard newspaper review style ($$$ for price, bells for noise, etc.) but these aspects will be considered when a final verdict is given. Our philosophy when judging a restaurant is simple: will we be back? We feel this takes all aspects into account and weighs them in a way that matters to us. Going out isn’t all we do though. We both love to cook and Emily is working on this baking project that I’m sure she would love to explain later. We may even post things that we find interesting that aren’t food related. To sum it up, we love food and want to share this with everyone. Hopefully we can help some people out along the way and make some friends!